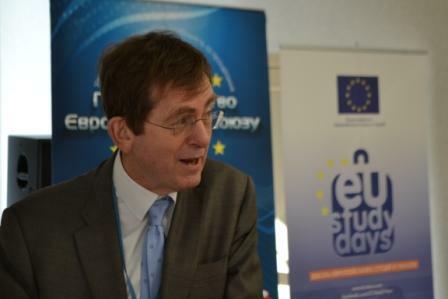 Andrew Rasbash, Head of Cooperation of the EU Delegation to Ukraine, spoke to students of the EU Study Days, an EU Delegation education project, in Odessa on April 3. In his lecture he explained the details of the EU’s assistance to Ukraine, in particular the recent €11 billion package pledged by the EU including €1.4 billion in grants from the European Neighbourhood programme. On general EU assistance to Ukraine. The EU has been cooperating with Ukraine since independence in 1991. So far the EU has committed €3.3 billion of grant assistance to Ukraine, and about €200 million are on the way, so we will have €3.5 billion by the end of this year. The main aim was to support reform, transition, and European integration. But if we look at the situation at the end of 2012 with a corrupt regime in power that has a clear orientation toward Moscow, we would be forced to say that this assistance has not been very successful. However, now the people of Ukraine have changed the government. Now, once again the government has expressed a clear orientation towards Europe, so European integration is the main challenge, in the context of a major reform, of fundamental reform, that should already have taken place in the 1990s. On the EU’s new €11 billion assistance package. You may have heard that the president of the European Commission, José Manuel Barroso, has come out with a very big number for the amount of support the EU will provide to Ukraine: €11 billion. If you put it in dollars, you get $15 billion. This is the same amount of that Putin offered to Ukraine. But, as one foreign minister of an EU member state put it, the EU is willing to give Ukraine $15 billion to support reform, whereas Russia was proposing $15 billion to buy the whole country. So, you choose. On elements of the €11 billion package. The €11 billion package is made up of different elements. A big chunk of it is a loan from the European Bank for Reconstruction and Development (EBRD). This is largely lending to private companies for profitable projects. Although foreign companies want to invest in Ukraine because it is a major European country with good growth prospects, in the past two or three years European banks that had invested here have been withdrawing and selling their investments. The EBRD package will help bring foreign investments back into the country. Another big chunk of the money is coming from the European Investment Bank (EIB). This is the internal banking arm of the EU and it focuses on infrastructure-type investment. It lends big money generally to the public sector (municipal sector for district heating, for example), whereas EBRD is mostly focused on the private sector, although there is some overlap. Another chunk of money is €1 billion in macroeconomic lending, aimed to support the economic position of the country. That has almost been decided, and the key condition for the European lending is the IMF stand-by agreement. Finally we come to development grants: about €200 million per year – €1.4 billion after seven years. That’s the big chunk of funding with which we will support the Ukrainian reform process. It goes directly to supporting reform and European integration. c) Private sector development in the context of the Association Agreement. Indeed, the AA includes the list of EU directives that Ukraine commits to transpose into Ukrainian national law. These directives don’t normally affect ordinary people in their day to day life, but they do affect business. That is where major investments are needed. On bringing Ukrainian legislation closer to the EU norms. Transposing EU legislation does not need to be done immediately— there are long transition periods. Under the Association Agreement, there might be five or sometimes seven to eight years before the legislation has to be transposed into Ukrainian law and implemented. But if you are making business decisions now, you need to know about upcoming changes to legislation. For example, for electricity generation you burn gas and coal. There is very strict EU legislation about this sector because of concerns about air pollution, which is very damaging to public health. In fact, Ukraine has already committed to implement this legislation by January 1, 2018. But that means big investments by power companies. Note, however, that the Ukrainian power companies are owned by wealthy businessmen, so can perhaps they can afford it. On efficient reform. The first prerequisite for efficient reform is that people really believe that you can actually run a country without serious corruption. So you need to generate that belief first, which requires a massive act of political leadership. We don’t have the answers but what we would like to do is to support the people who (we hope) do have these answers, which are the Ukrainian government and the civil society. So what we are doing is putting together something called a “State building contract.” This means granting a chunk of money to support the transition into a less corrupt, more normal system of government. We are committing €355 million that is not a loan but a grant, so it should not be paid back. There will be two payments: the first tranche will be paid upfront, on the basis of very limited conditionality, in the first half of this year. The second tranche will be paid in the middle of next year, on the basis of progress particularly in the fight against corruption.